National Guard troops, Highway Patrol officers and teams of state prison inmates have joined fire crews struggling to battle the deadly Carr and Ferguson fires. Triple-digit temperatures and steep terrain are challenging firefighters' containment efforts. The Ferguson Fire is burning in remote areas surrounding Yosemite National Park.The wildfire has scarred more than 56,000 acres and is currently 30 percent contained. CalFire officials say they should have it fully contained in roughly two weeks. The Carr Fire continues to threaten homes in Shasta and Trinity counties, as firefighters battle against wind and extreme fire conditions. Fire officials lifted some evacuation orders today, but thousands of people are still prohibited from returning home. The fire is 20 percent contained, with crews working to hold the control lines they built Sunday night . Redding Police Chief Roger Moore spoke of the fear many are feeling and the need for prompt evacuations. "This fire is scary to us. It's something we haven't seen before. It changes direction so often. If you receive an alert on your phone or see an officer urging you to evacuate, please listen to us and get yourself out." The Carr and Ferguson fires are only 2 of 17 major blazes currently being fought across the state. Each requires a dedicated team of firefighters, and as resources become strained the state is mobilizing additional sources of manpower across 125 agencies to help with firefighting efforts. California Highway Patrol Commissioner Warren Stanley has sent 118 uniformed officers to the Carr Fire to help with evacuations, including officers from the Bay area. The Conservation Camp Program, an inmate work project under the direction of the California Department of Corrections and Rehabilitation, is also sending its teams. The program provides an able-bodied, trained work force of inmates who must be approved to work alongside Cal Fire crews on fire suppression. The program supports around 3,500 inmates, spread across the state in 43 camps. The men and women of the program live in their assigned camps year-round, working on fire prevention and conservation projects when not actively fighting fires. Conservation Camp teams numbering 1,700 inmates are currently being dispatched across 10 different fires to help cut containment lines and maintain equipment. Most of the effort, Sessa says, is being directed toward the largest fires. 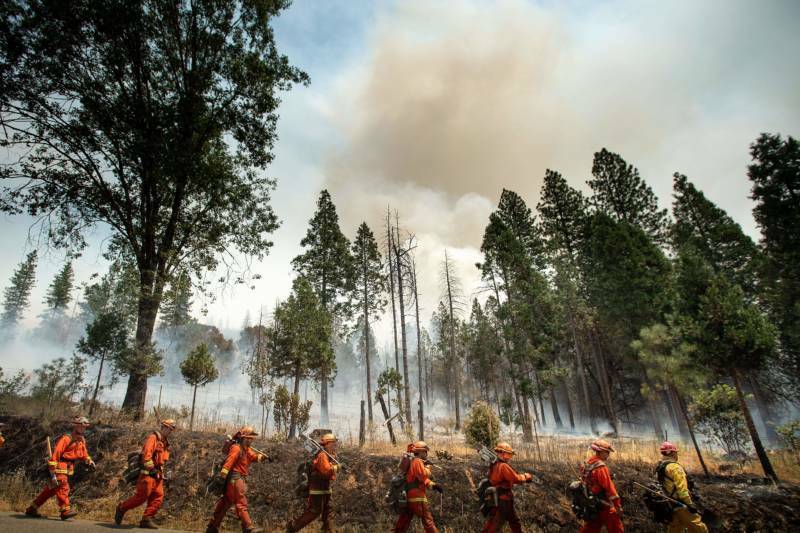 There are currently 450 inmates assigned to the Ferguson fire and 599 to the Carr fire. They frequently work for 24 hours straight, carrying heavy loads of up to 60 pounds. Working in teams of 12 under the direction of Cal Fire captains, they hack away vegetation in an effort to stop the spread of fire or to change its direction. Volunteers are evaluated based on their security risk, physical ability and criminal history, Sessa said. The California National Guard has also sent 800 troops to the Carr Fire. Among them are crews to operate six helicopters, two C-130 planes to drop fire retardant, and an MQ-9 remotely-piloted aircraft for collecting real-time footage. The Ferguson and Carr fires combined are responsible for eight fatalities, including four firefighters and four civilians. But with more than a dozen people reported missing, authorities warn this number could rise. 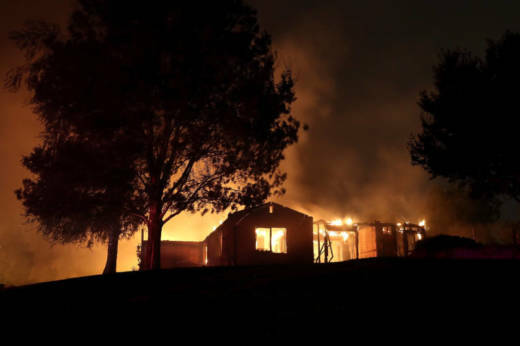 As the Carr fire encroaches on Redding city limits, the threat of extensive property and structural damage also increases. Several hundred structures have already been destroyed, with a further 5,012 threatened. Governor Brown received a fire management assistance grant to help fund firefighting efforts, and has also received direct federal assistance from the White House. Michelle Wiley contributed to this post.